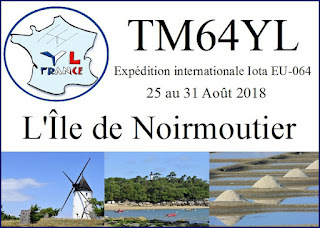 TM64YL - Noirmoutier Island- 25 - 31 August 2018. They will operate on HF Bands. QSL via F4GHS. 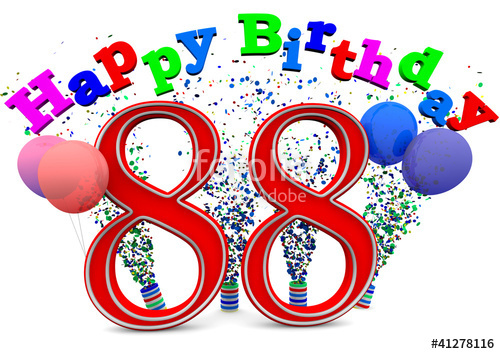 Address for direct QSL: CHRISTINE CARREAU, 13 CHEMIN AUX BOEUFS, GUECELARD, 72230, France. An island off the Atlantic coast of France in the Vendée department, it is only half a mile off the west coast and is connected to the mainland by a bridge, Le pont de l'île de Noirmoutier; and the causeway 'Passage du Gois'. This 3 mile long cobble paved causeway is only open during low tide. Le Gois is visited by thousands of visitors a year who come to watch the road emerging from the sea as the ebbing tide recedes, or to see Le Gois disappear below the waves. Others come to collect the shell fish on the vast silted mudflats exposed at low tide. The Island’s only deep water harbour Port de l'Herbaudiere on the northern tip of the island, has trawlers, crab and lobster fishing boats and a pleasure boat marina. The Island is 49 km2 (19 sq mi); 20 kilometres long and at its widest 7 kilometres; two thirds of it being below sea level, with some 50 kilometres of beaches. The landscape of the island is one of low lying fields, salt pans and marshes protected by sand dunes, dikes and forests. Walking and cycling are the best ways to explore during the holiday season. The highest point on the island elevation 20 m (70 ft, )is at the Château de Noirmoutier from which you can get a panoramic view of the island. The Young Ladies Radio League (YLRL) 2018 Convention, is in Oklahoma City, OK. organized by YLRL district 5 and only happens once every 3-4 years. YL Convention Speakers: Digital Modes - Ria Jairam N2RJ (YLRL District 2 chair) ; Rovering - Andrea Slack K2EZ; DXpedition Holiday Style - Carol Milazzo KP4MD ; &Banquet Keynote Speaker Nancy Hall KC4IYD, NASA research scientist. Franjo, 9A2MF, a former lighthouse keeper at various lighthouses around the Istria peninsula, is responsible for this operation. He and his wife Anica, 9A7SSY, spent 4 years at the Savudrija lighthouse as its lighthouse keepers. Both of them are members of Radio Club Croatian Flora Fauna. Activities will be on all bands and modes from March 1st until end of December 2018. 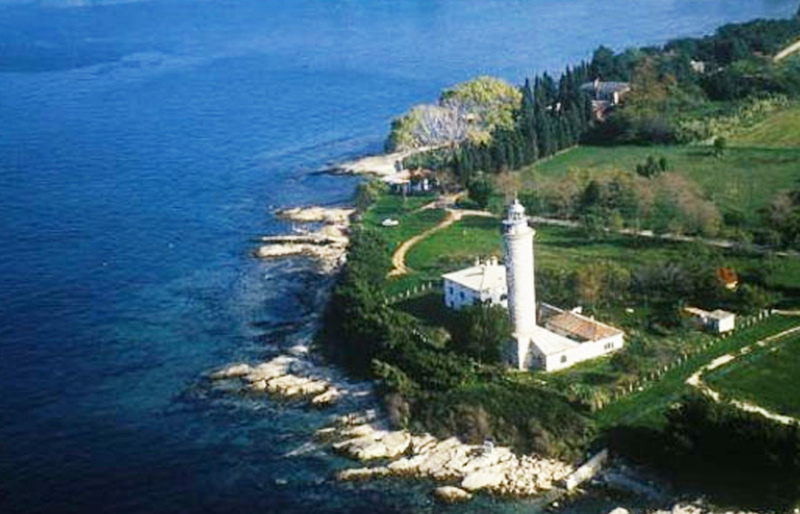 Savudrija is a small fishing village with the oldest lighthouse on the Adriatic, built in 1818. At a height of 36m above the sea, the light has a range of 30 nautical miles. Although automated, the light is still manned by lighthouse keepers helping to secure and maintain the site. Rooms within the lighthouse have been made available for rental. The nearest tourist center - famous destination for tennis lovers - Umag, is situated only 9 km away. The area is popular with windsurfers. 0001 UTC 18th AUGUST 2018 TO 2400 UTC 19th AUGUST 2018 (48 hours or part thereof). This year's event is dedicated to the memory of friend and Publicity Officer of 9 years, Jim Linton VK3PC, who passed away on 22nd February 2018. The ILLW is not a contest. There are no prizes, certificates, or other enticements to participate. One of the objectives of the ILLW is to encourage the restoration of lighthouses all around the world. 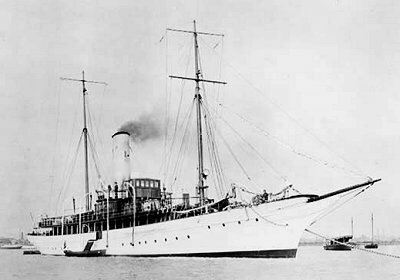 It was aboard the original Elettra (yacht), which Mr. Marconi bought in 1919, that the scientist explored short-wave radio and radar, perfecting the process he used in 1901 when he sent the first Morse Code letter, a faint ''S,'' across the Atlantic Ocean. In 1922 Marconi made his first Atlantic crossing in the "Elettra". Guglielmo Marconi, so adored his research ship that he named a daughter after her - Elettra - instead of the other way around. The ship, which the scientist used as home and laboratory, was destroyed in World War II, and a piece of Mr. Marconi's history was lost with it. As part of the Museum Ships Weekend (June 2-3, 2018). members of the A.R.I. Fidenza Radio Club (Italy), sponsored by the Guglielmo Marconi Foundation, using callsign II4AMP activated Elettra for the sixth time. The station is close to the remains of the keel of Guglielmo Marconi's yacht 'Elettra', which is kept at the Museum. The event allows radio amateurs around the world to make contact. 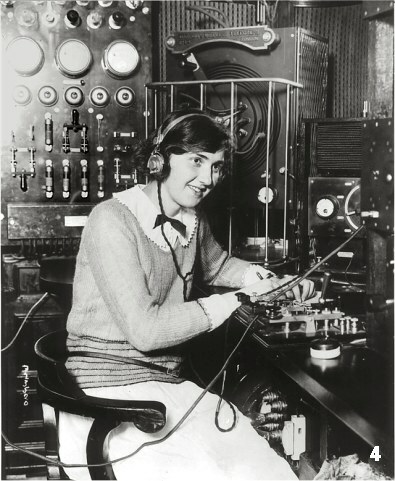 "This photograph shows Miss Eleanor Steele of Schenectady, NY , radio operator on Senator Guglielmo Marconi's own radio outfit on board his Elettra, while cruising down the Hudson to Albany, New York, 1922. This is a very unusual photograph, in that being a radio operator was considered an extraordinarily masculine job in the 1920's. In 1900, Marconi set up a high-powered transmitting station at Poldhu, on the English coast at Cornwall and in 1901 he built a wireless station at Signal Hill, Newfoundland and on Cape Cod, Massachusetts. Storms blew down the aerials at Poldhu on September 17, 1901 and those on Cape Cod on November 25th. Marconi received the first transatlantic signal - the three-dot Morse code letter "S" tapped out from Poldhu on December 12th, 1901 at the Newfoundland station. On January 18, 1903, President Theodore Roosevelt's message was tapped out in Morse code from South Wellfleet (Cape Cod) to King Edward VII at the Poldhu station. It was to be the first two-way transatlantic communication and the first wireless telegram between America and Europe. Princess Elettra Marconi Giovanelli of Italy, born in 1930, was the daughter of Marconi and his second wife, Maria Cristina Bezzi-Scali. She inherited the Palazzo Marconi in Bologna in 1936 when she was 6, upon the death of her uncle, Alfonso, one year before her father’s death on her 7th birthday. She acquired the title of princess through marriage to Prince Carlo Giovannelli in 1966. As the daughter of the renowned inventor and electrical engineer Guglielmo Marconi, who won the 1909 Nobel Prize for his pioneering work in the development of wireless technology, she has continued to help spread the story of her father and his influence to people all over the world. Princess Elettra Marconi visited the site of the Marconi Wireless Station in Wellfleet on Cape Cod, on May 31,2018, where she was able to make radio contact with the Newfoundland site where Marconi received the letter “S” 1901 and made his first transatlantic wireless transmission to England in 1903. 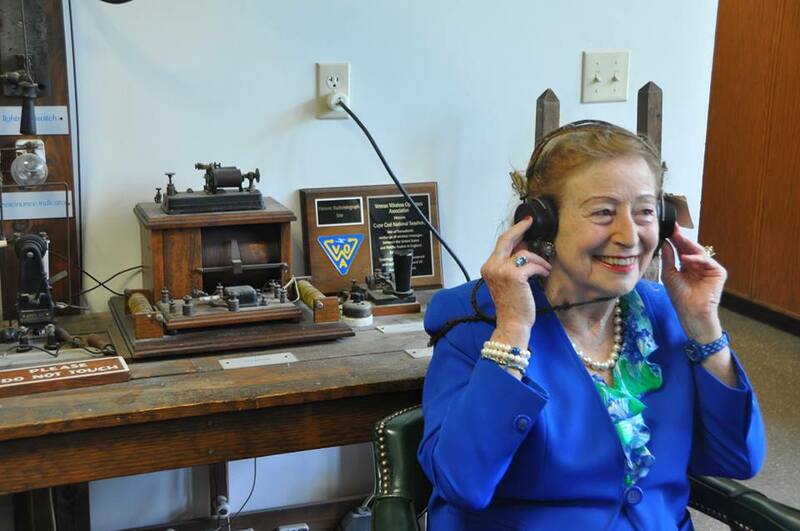 See: Km1cc - Marconi Cape Cod Radio Club (Facebook) for great pics and videos. The idea of creating the YLC group was born.from a conversation between two colleagues, and now, with the formation of Radio Club YL Chile - CE4YLC, this anniversary has special relevance. 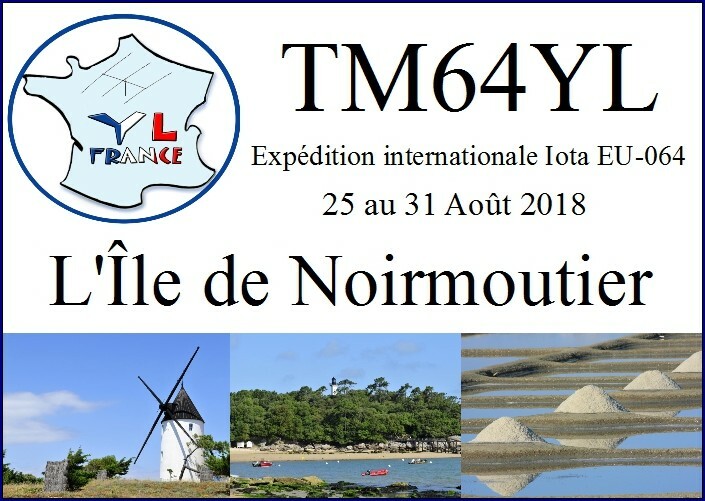 YLC wants to celebrate the fourth anniversary by inviting all amateur radio opertors to participate in a contest in the 40-meter band, in phone mode, during the weekend of August 25-26, 2018.
: All licensed operators throughout the world are invited to participate. OBJECT: Participation: YLs work everyone, OMs work YLs only. Contacts made on Echolink will also be accepted. The current Rules have been simplified from last year and are on the website http://www.alara.org.au/contests/index.html so check them out and let’s have more YLs on air this year PLEASE!!!!!!! 26 July, 2018 , Portuguese yls, celebrated 2nd anniversary! 8 -15 YOTA zomerkamp 2018 in de omgeving van Johannesburg in Zuid Afrika.